2/25/2015 1:04:00 PM - kmo911 lovely game.some bugs get the colector cd version. mission falure missions should have a skip mission on it. 10/13/2014 8:25:00 AM - AMAZING!!! Forgot how great this game was! 8/20/2014 6:43:00 PM - Ons Shy Ok, this worked for me. In your explorer window, go to the folder where you put the Tie Fighter files. There should be a windows batch file that is called START. Drag that file and drop it on the shortcut for DOSBox. I had been trying a bunch of things for the last few days with no luck until this. Worked perfectly. Been playing all morning on Windows 8. 8/11/2014 1:21:00 AM - Travis Can play from the Play NOW ! but when downloading game and running DOSBox and typing tie.exe, install.exe or start.bat all takes me to the Install Screen where everything is blacked out except, uninstall. 8/10/2014 4:15:00 AM - Aaron HELP! 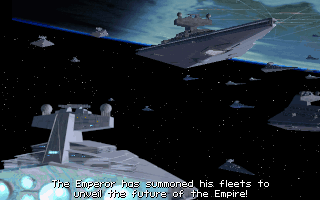 When running TIECD from DOSBox, and typing in tie.exe, it takes me to the install screen where I can only uninstall. I do I play the game? 6/10/2014 1:08:00 AM - Marek Intan How do remap the controls with this game? The "Fire" key is mapped to my mouse, but I want it mapped to my joystick's trigger! 5/11/2014 2:49:00 AM - ClockworkElm this game was my childhood. Thank you thanyou thank you! 4/27/2014 4:20:00 AM - ThorPerson So does a Logitech then not work at all? 1/25/2014 7:32:00 PM - I can't get it to work same hard drive error as Richard and have tried suggestion listed here from Vassy and similar from other sites. Have mounted both cd and hard drive as cd with no luck. 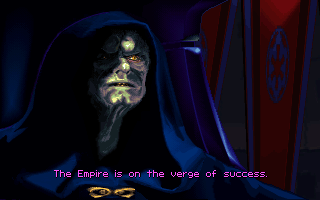 Start.bat just crashes dosbox. 1/23/2014 10:08:00 AM - Duo Maxwell of Afternet To whomever decided to put this on this site: You are my new best friend that I haven't met yet. 12/16/2013 4:33:00 AM - Nadros Still one of my favorite games! 11/22/2013 6:23:00 AM - TK421 Wow! It has been nearly 20 years and I still have the commands memorized. How many hours of my childhood were spent in pursuit of higher ranks in the secret order?! 10/3/2013 4:36:00 AM - BadPuppy Joystick for Dummies: I am by know means an expert but I have noticed. (1) Game pads with Joysticks IE PS3 style will never work. (2) Make sure the stick is of basic design and USB compatible. IE Basic Logitech or ThrustMaster. 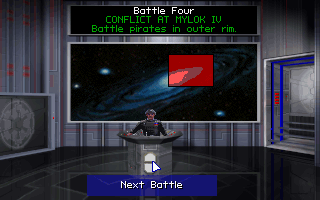 (3) make sure your joystick software has access to the dosbox program. Some basics for you to try. 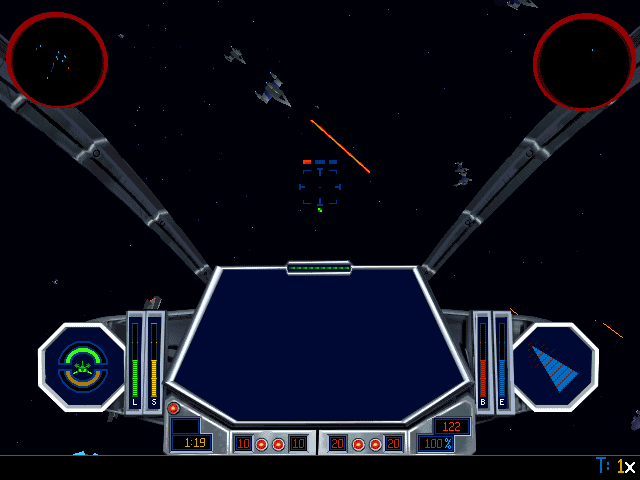 9/4/2013 5:41:00 PM - tiefighterplayer Did not have to do anything special to get my joystick working. It just works. Bought it new just to play this game again, so not like it's an older one or anything. 8/29/2013 7:02:00 PM - Pilot Does anybody know how to get the joystick working? I can`t select it (only mouse and keyboard works)??? Thanx! 8/27/2013 9:28:00 PM - Vassy Took me a while to make it work. What I did was: 1. 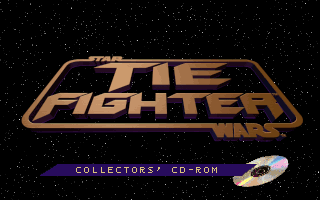 Within the downloaded file, mount Tie Fighter CE\image\tiecd.iso with daemon tools etc. 2. Copy all files within the cd onto a location such as c:\test 3. Open dosbox, mount c c:\ mount d c:\test -t cdrom 4. Go to d:\ within dosbox, type install. Install to c:\tiecd 5. go to c:\tiecd, type TIE and play! 8/6/2013 2:39:00 PM - Lynx Simply great!!! Played this game ages ago... but still love it! 7/30/2013 3:19:00 AM - Awesome Thanks for this! To run this in DOSBOX, follow this guys instructions. 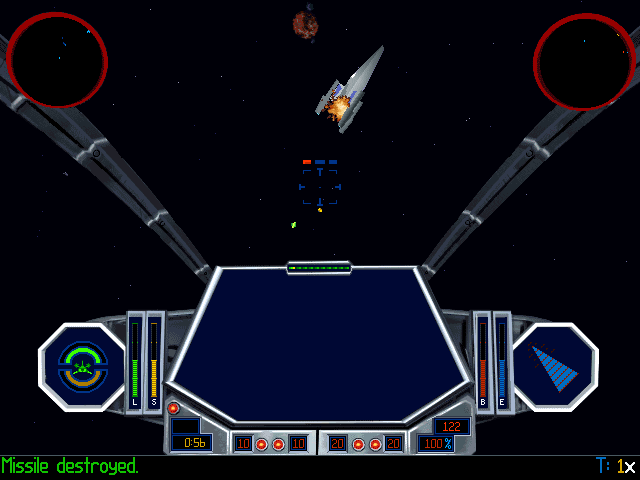 http://www.resolveitcomputers.com/how-to-play-tie-fighter-on-a-newer-pc Also grab the tiefighter joystick update from lucusarts and change your dosbox config so that 'joystick=false', search the forums for more. 7/21/2013 8:03:00 AM - cp10 So does DOSBOX work with this game? I keep getting sent to the "install" screen when I run the .exe file. Can't actually start the game in DOSBOX (Note: X-Wing works just fine in DOSBOX from this site). Please advise. 6/24/2013 5:54:00 AM - J86 Hey there, I have a Logitech Extreme 3D Pro Joystick. I've calibrated and re-calibrated the thing and it still doesn't work. Any suggestions?? Spinning in space has given me a head ache, thanks! 6/14/2013 7:28:00 AM - George Richard: You should be able to simply run the downloaded game by drag&drop START.BAT on the Dosbox Desktop icon. 6/9/2013 2:09:00 PM - FreeGameEmpire I have uploaded a new version please check the joystick issues. Thanks. 6/9/2013 2:46:00 AM - Blake93 This is great! Wish we could get the X-Wing Collector's Edition on here!!! 5/30/2013 4:44:00 PM - #1 Imperial Fan Where are the other battles? There are only 1-4. I would love to see more. 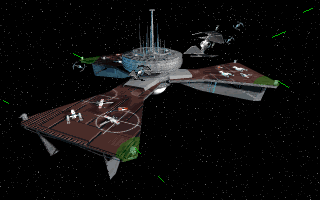 5/30/2013 7:31:00 AM - josh anyone know where i can get xwing alliance? 5/19/2013 4:53:00 AM - Greg Trying to use a xbox controller with this. will not calibrate. Any thoughts? 5/9/2013 10:37:00 PM - Andrew Gordon Hello. MS Sidewinder works fine on normal tie fighter. Have tested in windows. Does not work in TF collectors. Rolls left and dives. Will not callibrate. I read all the posts and didnt see any help. I play game using website emulator. I cant run it independantly. Please help. 5/4/2013 1:01:00 AM - ohio I downloaded the game but not sure how to get it to run on windows 7. 5/3/2013 2:14:00 AM - Mike Waterhouse Trying to get this working with MS SideWinder Force Feedback joystick like QTexas. Has the joystick content.xml been modified to make this work. Mine just halts as you config j/s to up left and stalls. Thanks. 5/2/2013 5:22:00 PM - DCDusty33 THX! 5/2/2013 8:44:00 AM - FreeGameEmpire The timed setting seems to solve it. I have replicated the problem, I just hope it wont break the working joysticks :-) The new version is uploaded, if you changed the settings manually, you dont have to download it again. 5/2/2013 8:18:00 AM - john Portland It wont let me edit the file. 5/2/2013 8:16:00 AM - FreeGameEmpire QTexas: Thanks for the tip, I'll check it. 5/2/2013 3:48:00 AM - QTexas I was having the same problem with the joystick as well, I use a MS SideWinder Force Feedback joystick. 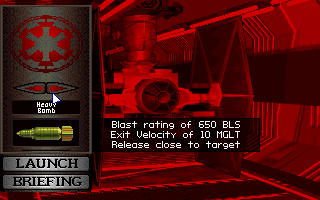 I managed to get around this problem by downloading the TIE Fighter Image provided here (Thanks for that =) ) and opening the content.xml file and modifying the line "timed=true" to "timed=false" under the [Joystick] attribute. I relaunched the game, calibrated my joystick and now it works flawlessly. Hope this helps! 5/2/2013 2:04:00 AM - john Portland My joystick(Logitech Attack3) will not calibrate right, it stays stuck moving top right, please fix. 5/1/2013 7:33:00 PM - FreeGameEmpire I'll take a look at it, there seems to be a patch for some joystick issues. I'll give it a try. 5/1/2013 6:09:00 PM - FreeGameEmpire It's a matter of Dosbox, there is not much I can do. However I cannot find any issue with this specific joystick, what does it do ? Do you get calibration dialog when the game starts or not ? If not, your joystick is probably not recognized which is bad, can you try another one ? 5/1/2013 5:40:00 PM - DCDusty33 Can you possibly make it compatible? Maybe? 5/1/2013 4:17:00 PM - FreeGameEmpire Mine is working. Unfortunately not all joysticks are supported, maybe someone can suggest an option for you if you post a joystick type you have. 4/30/2013 11:13:00 PM - DCDusty33 My joystick won't work! help!